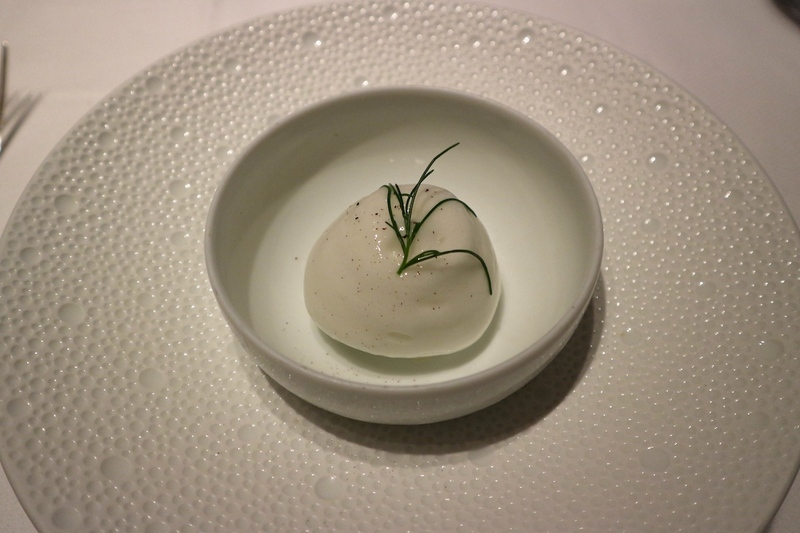 Though it initially originated in France, Le Bernardin has been a permanent fixture on the New York fine dining scene for more than three decades now. The restaurant, originally named Le Moines de St. Bernardin, was established in Paris in 1972 by chef Gilbert Le Coze and his sister Maguy Le Coze. When the duo moved the restaurant to New York City in 1986 it was renamed to "Le Bernardin". Executive chef since 1994 is Eric Ripert and the restaurant has held three Michelin stars since the first edition of the New York City guide (2006 guide). It has featured consistently in the World's 50 Best Restaurants list since 2006 and it is at number 24 in the 2016 edition. Eric Ripert (b. 1965 in Antibes) spent his early culinary career in Paris working at La Tour d'Argent, at that time still holder of three Michelin stars and under the reign of Dominique Bouchet. Ripert was 17 years old at the time. Some two years later Dominique Bouchet got Eric Ripert a job interview at Joël Robouchon's Jamin. It was December 1983. Earlier that year Jamin had been elevated to two Michelin stars and the restaurant was pushing toward a third star. Michelin awarded Jamin the third star a couple of months later in the 1984 guide for France. In 1985 Ripert was called for miltary service but he returned to Jamin afterwards. His new position was fish chef, and later on he was promoted to head of the fish station. In 1989 Eric moved to the United States to work as a sous-chef at Jean-Louis Palladin's restaurant Jean Louis at the Watergate Hotel in Washington DC, a job Joël Robuchon had arranged for him. Next, in 1991, he moved to New York where, after a brief stint at David Bouley's eponymous restaurant in TriBeCa, he became head chef at Maguy and Gilbert Le Coze's Le Bernardin. In 1994 Gilbert Le Coze unexpectedly passed away at the young age of 49, and Eric Ripert succeeded him as executive chef. 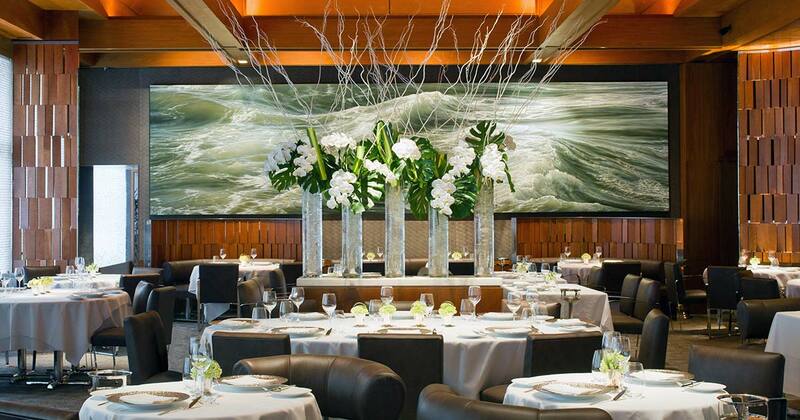 Le Bernardin is open for lunch and dinner Monday through Saturday (no lunch on Saturdays). The restaurant offers a prix fixe à la carte menu ($87 for 3 courses at lunchtime, $150 for 4 courses at dinnertime), and there are two tasting menus. There's the 8-course "Chef's Tasting Menu" for $220 and there's the 7-course "Le Bernardin Tasting Menu" for $180. 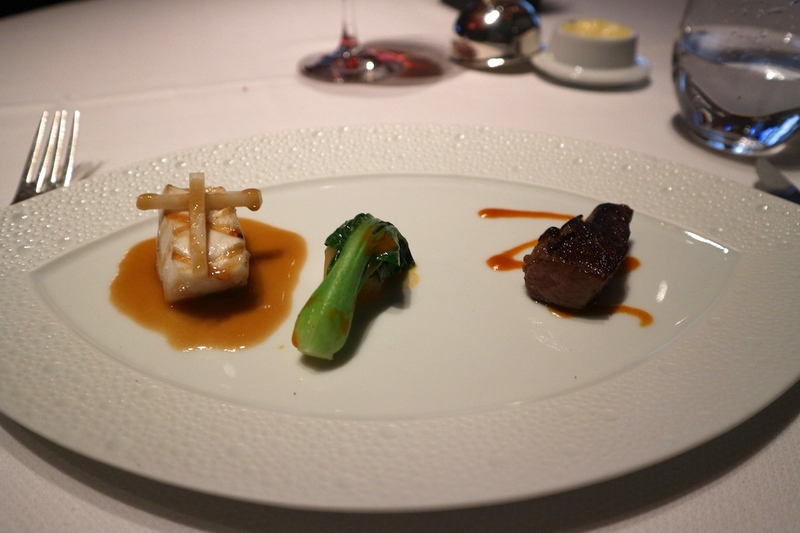 I had lunch with my husband at Le Bernardin and we both ordered the Chef's Tasting Menu. Lunch started with some salmon rillettes, a delicious mixture of smoked salmon, poached salmon and chives, served with crisp sourdough toast. 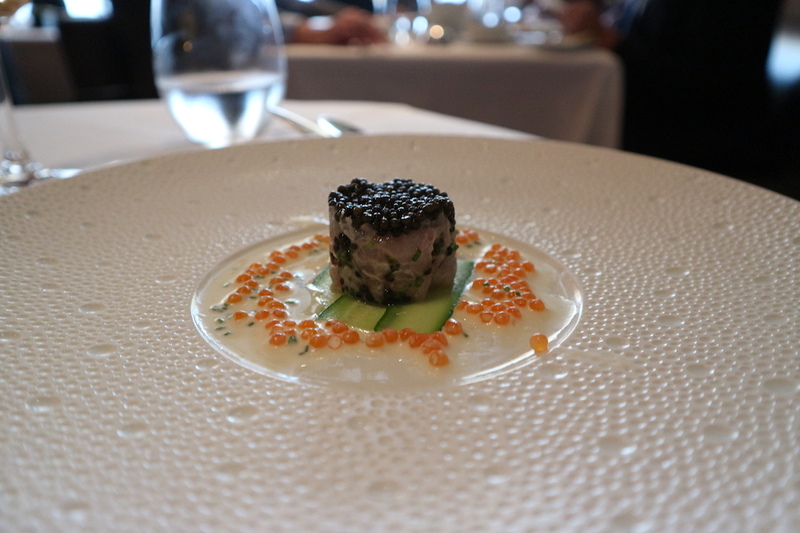 The first course of the tasting menu was a roughly chopped king fish (aka yellowtail) tartare, elegantly seasoned with finely chopped chives, topped with Oscietra caviar and placed on some thinly sliced cucumber. Spooned around the tartare was a crème fraîche, chive and smoked trout roe sauce. 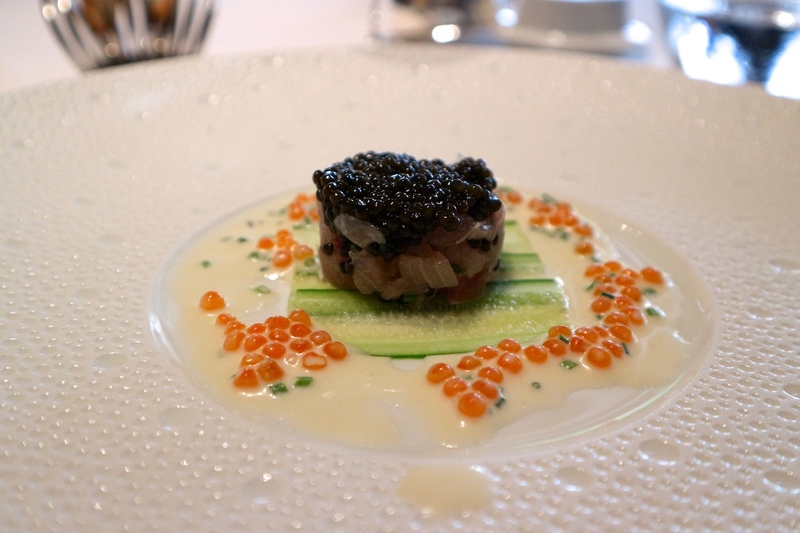 Lovely creamy freshness coming from the crème fraîche, which had been slightly thinned down with rice vinegar, and the salty caviar enhanced the delicate flavours of the king fish. A delightful dish, the only letdown, however, was the uneven plating/shape of the two tartares that were on our table. At a restaurant of this standard, you'd expect the plating to be consistent. Second course was beautifully tender and succulent lobster (lightly lacquered with a tomato and cognac paste), a spring roll with a filling of glass noodles, thin matchsticks of green and red pepper, carrot, lettuce and a piece of lobster, served in a light and clear lemongrass consommé, seasoned with a touch of ginger and coral. 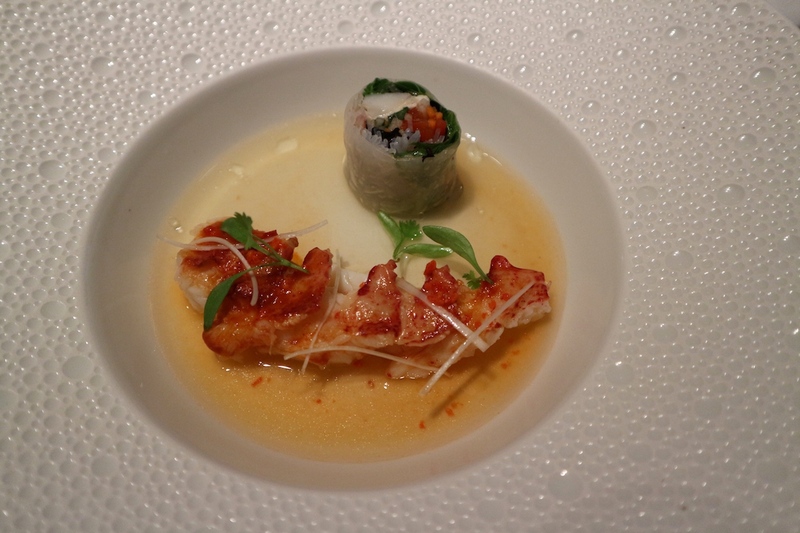 An excellent dish with clean flavours and precise seasoning, the mild citrus notes in the consommé matching the lobster wonderfully and the spring roll adding texture and contrast. The next dish featured more intense and richer flavours. 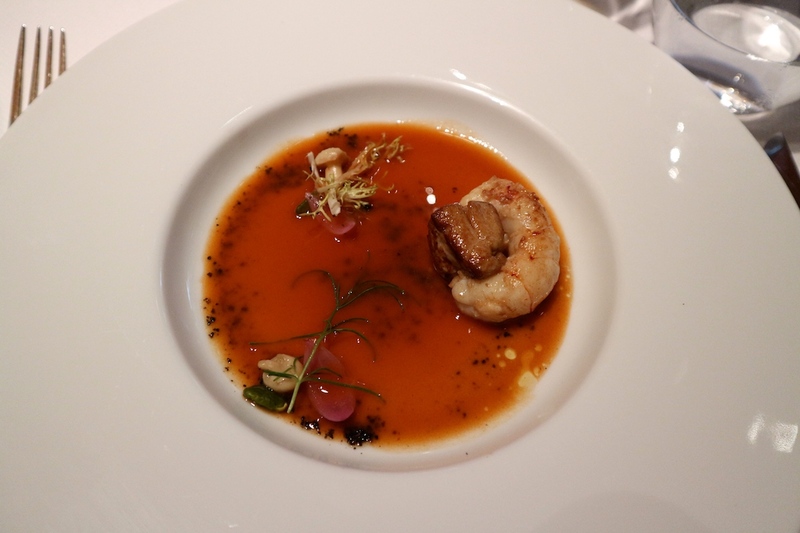 Roasted Scottish langoustine was well-paired with pan-fried foie gras, pickled onion, and mushroom, but best of all was a Périgord sauce, with a langoustine stock base and flavoured with Madeira, truffle, and tomato. A terrific, elegantly rich sauce, with wonderful Madeira (medium-sweet) flavours but also the lovely taste of langoustines coming through in the finish. On to the fourth course, a piece of superb organic Scottish salmon, barely cooked, with glorious firm and silky flesh, the right amount of "raw" in the centre, and the freshest salmon flavours with lovely buttery notes. Highlighting the salmon's characteristic orange colour, was a pea and broad bean sauce, nicely flavoured with mint and tarragon. On top of the salmon was a cracked black pepper mignonette, offering a nice sharpness to balance the richness of the salmon. These days salmon is hardly featured on restaurant menus, let alone in a tasting menu of a three Michelin starred restaurant, Japanese restaurants obviously excluded. I guess this could have something to do with salmon's image of being an overused and cheap ingredient. An unjust image, because if prepared with skill, salmon is such a brilliant joy to eat. A piece of perfectly moist and flaky halibut followed, served here with Manila clams, asparagus tips and an intensely flavoured wild mushroom casserole. Characterful but refined flavours, the mushroom casserole having a lovely, almost meaty richness. The sixth course was grilled escolar (described on the menu with the slightly misleading name of "white tuna") garnished with strips of Japanese pear, and served with a soy and citrus sauce. Also on the plate was some "fresh" Chinese cabbage and baby pak choi kimchi, and a piece of wagyu beef. A lovely, well-executed dish, the escolar being meltingly tender and flavoursome, and the à la minute kimchi being a nice touch. The presentation on the other hand, really needs some work. Next up was a pre-dessert called "Cucumber "Pisco Sour"", a pretty, slightly boozy dessert of cucumber and pear sorbet covered with a creamy Pisco Sour foam. Dessert proper was "Black Forest", a modern take on the classic Black Forest Gateau ("BFG"), a dessert that obviously reminded me of The Fat Duck's BFG. There was a light chocolate cake and cherry compote base/centre, which was covered with a vanilla cream mousse, sprayed with chocolate, and decorated with smoked chocolate cremeux and chocolate curls. Finally there was a brandied cherry sauce. 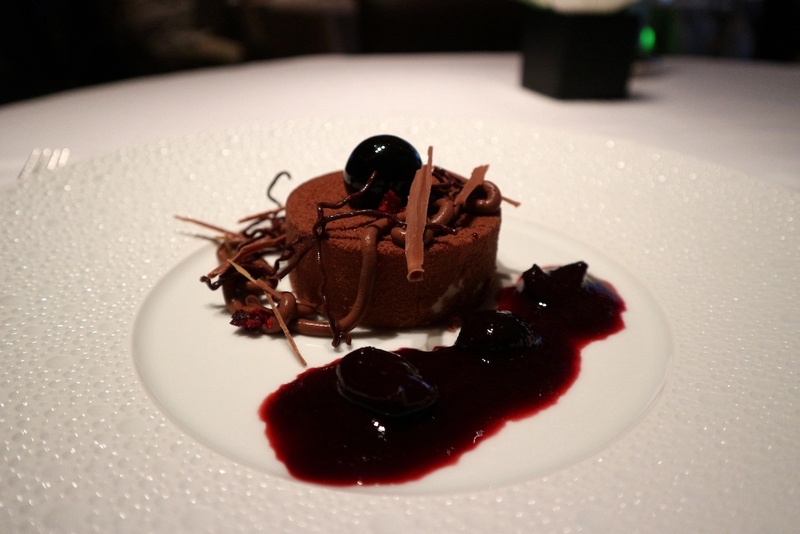 A dessert with strong, characteristic black forest flavours, yet, however enjoyable it was, it was no match for Blumenthal's intricate and refined BFG. At first sight Le Bernardin meets all the high standards of a typical French three Michelin starred restaurant. There's a grand dining room, the service is immaculate, there's an amazing bread basket (although the bread is not baked on the premises), and there's an award-winning wine list with 900 entries based on a 15,000 bottle wine cellar. On top of that there is a vibrant energy in the restaurant, the kind you only find in New York City, and which is often absent in triple starred Michelin temples in some of the other cosmopolitan cities in the world. What about the food, however? 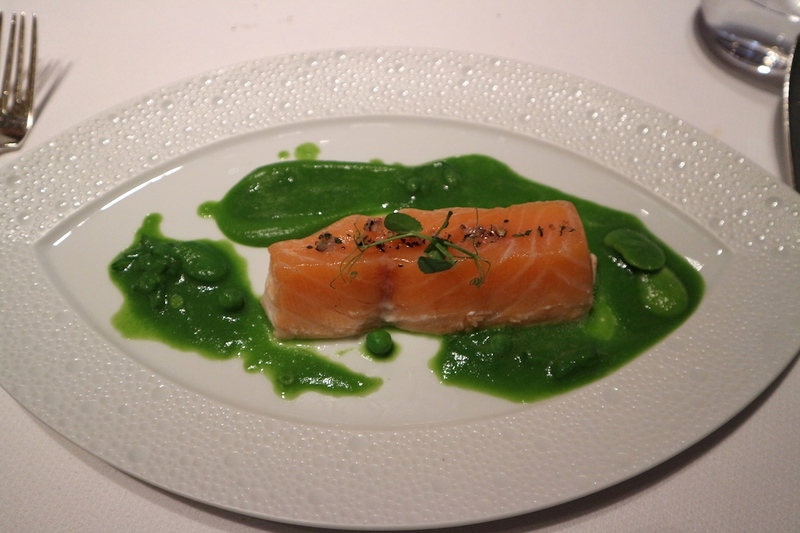 The quality of the cooking at Le Bernardin is excellent and the ingredients used today were top-notch, especially the salmon, an outstanding dish which was the highlight of the meal. 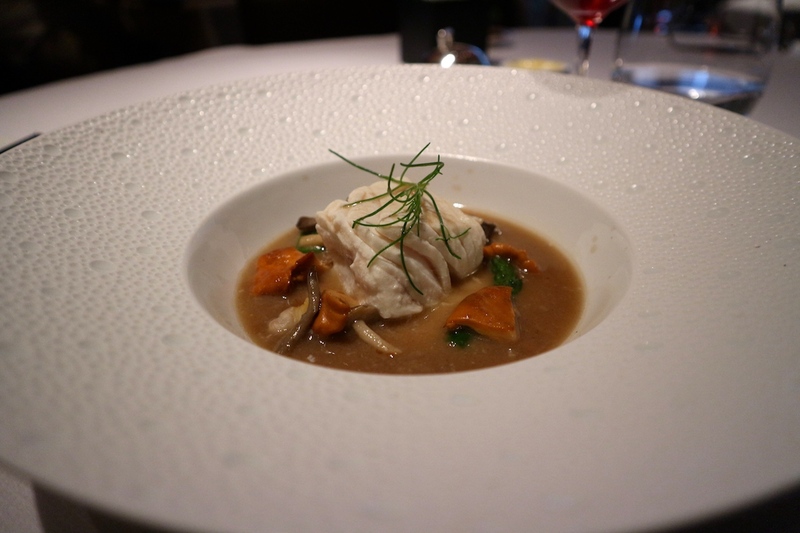 I can see why Le Bernardin is so well-rated, but the dishes served to me today didn't meet a certain, expected level of refinement, both in presentation and in flavours. The food was excellent, like that of a good two-star restaurant, but not necessarily of three-star quality. Competent dishes but no masterpieces.